Since 1998, bestselling author Gary Zukav has joined Oprah Winfrey 34 times on her show. The result is an engaging, ongoing conversation between Gary and Oprah that has deeply inspired millions. 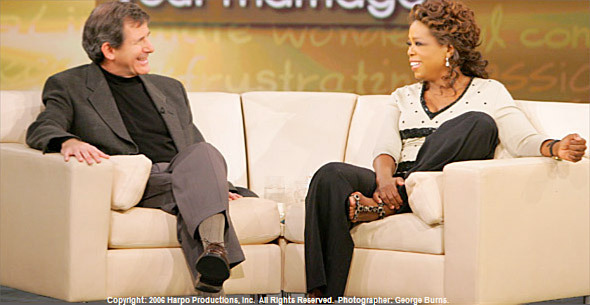 When Oprah read the Spiritual Partnership Guidelines, she invited Gary Zukav to do a show about them (January 24, 2007) and posted the guidelines, which are still on her website today. What is it about Spiritual Partnership that Oprah and so many others find so valuable? Learn how Spiritual Partnership can be of value to your life. Experience the inspiring highlights from these life-changing conversations between Gary Zukav and Oprah Winfrey. “The dynamics that produce emptiness and pain—the Universal Laws of Creation, Cause and Effect, and Attraction—also produce joy and meaning depending upon the choices that you make. Spiritual partners experiment with these dynamics and help one another choose wisely. Click the links below to explore them.